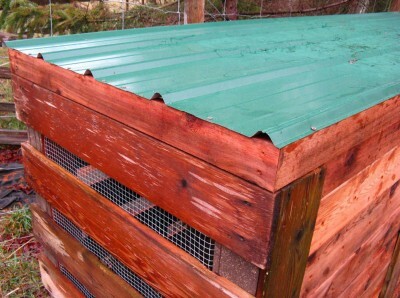 If in our land or garden our maintenance work produces many vegetable residues, the best way to manage them is undoubtedly using a large composter bin, and to don’t have to manage a garbage company, and the best of all is that it’s not even necessary to buy it, you can do it yourself with pallets. We need recycled wood, pallets, and pallet planks to create the big box with 3 different storages. You can use the pallet structure without modifying it to create this box. In this case all the structure rests over some concrete blocks which work as the foundation system. We should leave spaces between the planks for the ventilation and the chemical process of the decomposition. It’s important for the decomposition to keep some moisture in the boxes, not too much, so don’t place it under the sun. To separate the planks we can use small metal pieces like the one on the picture, or we can perforate the wood with some holes. The roof must be completely waterproof and can be purchased at any hardware or building store.